From “Mirror of the Contest of Courtesans of the Genroku Era” This print, and the four that follow, belong to the rare album Genroku tayū awase kagami, which Masanobu modelled on the Keisei ehon by Torii Kiyonobu I from 1700. Masanobu was probably just about 15 years of age then. 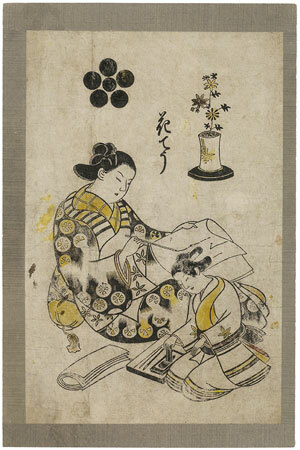 In this print, the beautiful Kachō is writing a love letter, while her kamuro is grinding the ink for her. OKUMURA Masanobu (ca. 1686 to 1764): For more than half a century, Okomura Masanobu was the most influential woodblock artist alongside the Torii Masters in the early period of this art. He was still practically a child when is extraordinary talent led to the publication of his first work Keisei-ehon in 1701, a catalogue of courtesans of Edo. Although this series of illustrations of women was still strongly influenced by Kiyonobu I, it is already possible to identify Masanobu’s special quality: the ability to integrate figures and space into a harmonious composition. Book illustrations, picture albums and single woodblock prints then followed in quick succession. The great variety of themes and the broad scope of his graphic means show that he was an artist who was widely acquainted with classical art and literature. He is thought to owe his literary erudition to the ukiyo poet and novelist Fukaku (recorded 1687-1692, Yoshida, III, p. 159). Not satisfied with his artistic abilities, Masanobu also investigated a variety of technical possibilities fort he realization of his ideas. Many innovations were based on his inventions. He succeeded in exploiting the possibilities of black-and-white printing in horizontal format to the full, often with a quite humorous touch. He himself claimed to bet he inventor of hashira-e, the long narrow pictures on pillars. He tried to imitate European perspective. Lastly, he also participated in the beginning of the development of multi-coloured printing. His concern for preserving his independence and for preventing his pictorial ideas from being stolen, led him to found his own publishing house in 1723, Okumura-ya, and create his own stamp of authenticity. This rare album was influenced by the Keisei-ehon of Torii Kiyonobu I. Masanobu was probably only fifteen years old at that time. Two copies have survived. This leaf comes from the Vever Collection and originally was part of the complete copy of the Drukker Collection. After auction at Sotheby’s (1974), it was divided up and sold as individual leaves. The courtesan Au-saka („Passway to the meeting“) sits on the floor dressing her hair, and attaches a carnation-shaped hairpin with a graceful gesture. Her kimono is decorated with large calabashes. For this courtesan, Masanobu chose Matsasune as his model from Kiyonobu’s Keisei-ehon. There, however, she is seated on a small bench. In Yoshikiyo’s Shidare yanagi the courtesan Sangō is shown in the same pose – namely sitting on a bench. Masanobu’s omission of the bench causes the girl to appear as if floating in space, this, however, clearly works to the advantage of the visual effect. Her mon appears in the upper right.